A Slice Of Americana at the Beach! Plan your picture-perfect beach getaway in a classic cottage. The Sea Stars & Stripes has everything waiting for your visit. Spacious 1 bedroom, 1 bath cottage, is just steps away from the beach. The comfortable porch is ready for sandy toes while you bbq dinner on the gas grill. Borrow the owner provided bicycles and ride to the Fresh Market Grocery or Damon Point for tide pools and beachcombing. Just steps away from the Village Square for lunch or dinner at the Bistro Cafe. Enjoy a cocktail at the Loft Martini Bar. The Fresh Market grocery and Namaste shop is just a short stroll from the village square. We also have an activity area with Horse shoe pit, Bocci ball, volleyball and community fire pit. The decor and amenities will take you away to a simpler time and into vacation bliss. 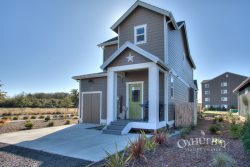 One of our most popular floor plans, the "Surf" this cottage is a favorite of Oyhut Bay visitors. The Oyhut Bay Seaside Resort is built on the edge of the Oyhut Wildlife Recreation Area. Often called the “natural side” of Ocean Shores, this area offers miles of sea level hiking. Bring your camera for some wonderful nature photography. The nearby North Jetty has spectacular waves to enjoy from afar - especially at high tide or on a stormy day. There is a waterways area across Marine View Drive that gives you access to the 26 miles of canals for kayaking. Even on the rainiest of beach days, you will look forward to spending your day inside the Sea Stars & Stripes Cottage, with a relaxing fire in the fireplace and a good book. There are no bad days at the beach. Although the weather was quite chilly for July, our experience in Oyhut bay was excellent. Our beach cabin was well appointed with everything we might need. I enjoyed cooking in the kitchen. We enjoyed bicycle riding and the hot tub. Off property, we rented kayaks and had a wonderful time exploring the canal system. Other times may be available, with a nominal fee. Based on occupancy.